Jyote Boora (BSc '16) was recently featured as a shining student for the University of Lethbridge. Jyote spent the last two years working in the NMR metabolomics lab and is now enrolled in medical school at the University of Alberta. Douglas Kiss recently graduated from an MSc program focused on 1H NMR based metabolomics of disease. Click the link below to learn more about his research experience. This new clinic is a partnership between the University of Lethbridge and a group of local radiologists. A two channel Bruker Avance II instrument equipped with a two channel BBFO probe. A four channel HFXY Bruker Avance III HD 500 MHz solid-state NMR Spectrometer equipped with several HFXY MAS probes. 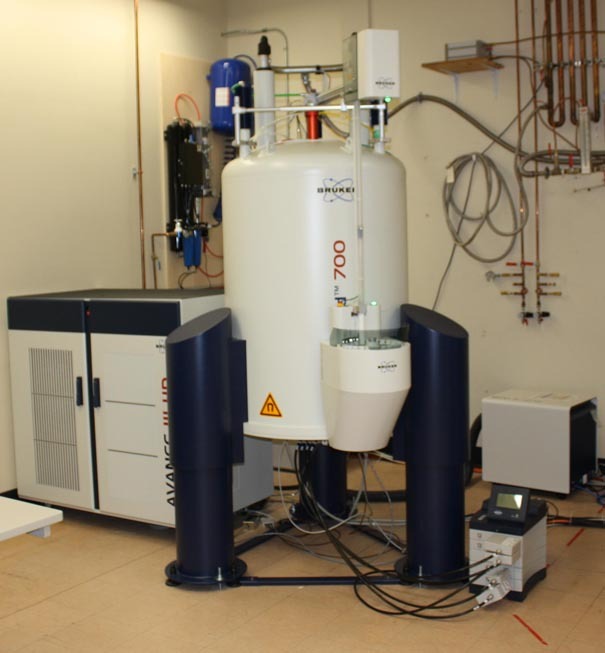 A four channel HFXY Bruker Avance III HD 700 MHz solid- and solution-state NMR Spectrometer equipped with two 5mm solution-state probes and one ultra-fast 1.3mm MAS solid-state probe. The Canadian Center for Behavioural Neuroscience (CCBN) houses a helium recovery system that is used on the 500 and 700 MHz NMR Magnet and the small animal MRI magnet. The University of Lethbridge Magnetic Resonance Facility has just received two substantial grants to renew and expand our facility. This includes the award of a $250,000 NSERC RTI grant to upgrade the HFXY console on the 500 MHz Spectrometer and a $1,600,000 CFI LOF award to purchase a new four channel HFXY narrow bore 700 MHz spectrometer! Stay posted for future news on these two exciting purchases!